FROM SAN FRANCISCO/BAY BRIDGE–via MacArthur Blvd. 1. After coming off bridge, take the I-580 E exit. 2. Stay in the left hand lane and take the San Pablo/MacArthur Blvd exit. 3. Stay to the left to remain on MacArthur Blvd for about 1.5 miles. 4. After crossing Telegraph Ave, stay in the left lane. 5. Turn left on Broadway Ave.
6. Go through 2 stoplights. After 38th street get in the Left lane to turn left. 7. Turn left on 40th Street. We are the second building past the parking lot. We are a short (5-7) minute walk from MacArthur BART. As you exit BART, walk out to the access street and turn left, you’ll be facing 40th street. Turn right on 40th and at the next light cross 40th so you’re on the other (north) side of the street. Continue walking down 40th for 6 blocks. We are 2 buildings down from Manila. If you reach Broadway, you’ve gone too far. 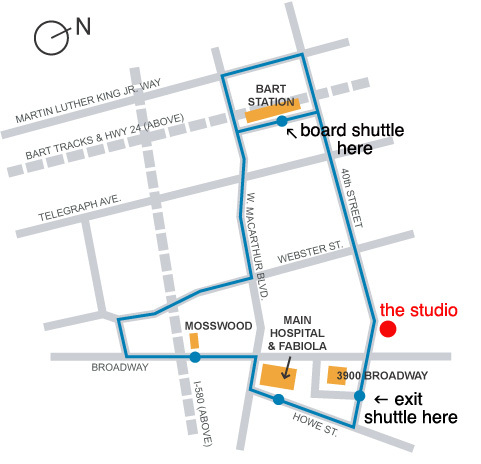 Kaiser also runs a free, convenient shuttle from MacArthur BART to within 1 block of our studio. Here's a map showing the route.